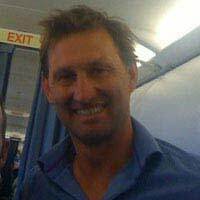 Tony Adams had an eventful England career sometimes the rock in the centre of a parsimonious defence, at other times frozen out, over a thirteen year period. Even so he collected 66 caps and is remembered in his prime as an outstanding leader and captain who led by example. Adams never played for any other club than Arsenal, who he joined as a schoolboy, making his first team debut at the age of 17. Four years later, in 1987, Adams made a well-received debut as then manager Bobby Robson looked for a new partner for Terry Butcher in the heart of the England defence, in the run-up to the 1988 European Championship. The match was a friendly against Spain which England won 4-2, Gary Lineker scoring all the goals, and Adams claimed a record: the first cap awarded to an England player who had been born after the World Cup win in 1966! The other young hopefuls for the spot next to Butcher were Mark Wright and Dave Watson, but in the end Butcher suffered a broken leg and all three contenders went to the Euro 88 instead. But the tournament was a disaster, Adams taking some of the blame for defeat by Ireland and then Marco van Basten turned him all over the place in second match, losing 3-1 as van Basten scored all the Dutch goals. England went home. By this time Adams had already taken over the Arsenal captaincy; only just 21 years old. Bobby Robson had, on Adams’ debut, said that he might well be a future England captain, but that wasn’t to happen just yet. In fact, in 1989, Adams lost his place to an up and coming Des Walker, a different style of defebder, faster and more mobile. This was partly because Adams had had a series of minor injuries, but there was still a lot of surprise expressed when he was not selected to go to Italy for the 1990 World Cup. Butcher, Walker and Wright played together in a sweeper system for the latter part of the tournament. After Italia ’90 Butcher announced his retirement from international football, and Bobby Robson gave way to Graham Taylor in the hot seat. Taylor went with Wright and Walker in the build up to the 1992 European Championship with Adams suffering from injuries and drink-related problems. However, when Wright was injured in the finals, UEFA refused a request to bring Adams in. After exiting the Championship without a win, Adams was recalled to the team which stumbled through a calamitous, and ultimately unsuccessful, qualifying campaign for the 1994 World Cup in the USA. Taylor was hounded out of his job after that, and new man Terry Venables took Adams and put him securely in the heart of England’s defence, alongside Gary Pallister and then as Euro 96 got closer, Gareth Southgate. Venables had also made Adams captain for the first time, in his 33rd match, a friendly 1-1 draw against Romania in 1994. The captaincy was then shared between Adams and David Platt for a while before Platt began to fall away as a first-choice midfielder. This was Adams’ finest hour, striding the Wembley turf like a colossus, inspiring England by force of personality as Venables took England to their best European Championship placing yet, going all the way to the semi-finals before losing on penalties to Germany (again). His contribution was much praised as he shouted, cajoled and bellowed the team together to produce some of the finest performances seen from an England team for many years, particularly the 4-1 defeat of Holland. Afterward he went public about his struggles with alcoholism and received strong support from the press, the England camp and new Arsenal manager Arsene Wenger. Glenn Hoddle replaced Terry Venables after Euro 96 and gave the captaincy to Shearer, unfortunately without properly informing Adams, which led to some animosity before the confusion was cleared up. Hoddle still kept faith with Adams as the defensive lynchpin and leader, and at last he played in a World Cup in 1998, appearing in every game, including the defeat by Argentina that saw England knocked out. After that Adams didn’t play so often but when Hoddle left suddenly under a cloud, caretaker manager Howard Wilkinson recalled him for crucial European Championship qualifiers. With the team now under Kevin Keegan, Adams was still there at Euro 2000, now past thirty but an irresistible force. But he was caught out by Nuno Gomez as he scored in the disappointing 3-2 defeat by Portugal, after being two-nil up. And although England beat Germany, they were then beaten by Romania and went out at the first hurdle. Adams continued to play under Keegan, and even regained the captaincy, as Shearer stepped down from international football, but after the disastrous loss to Germany at Wembley in the autumn of 2000, in the last game to be played before demolition, Keegan stepped down. Adams could see that a new manager would be picking younger players to build for the future and announced his retirement from international football before Sven-Goran Ericsson announced his first squad. Adams continued to play for Arsenal for another two years and then stepped down to study sports science at university before taking on managerial and coaching posts. He also spends time running the Sporting Chance Clinic, a foundation that he set up in 2000, aimed at helping sports people suffering from gambling, drug or alcohol addiction.